Unsure of what to do this half term? Wondering if the rain will ever stop and concerned cabin fever will set in? Well our friends at takethefamily.com have some fantastic ideas. So pull up a chair and grab your cup of tea or coffee, maybe a glass of wine depending on what time of day you’re reading this, and be inspired! Unless you’re lucky enough to be heading off for a spot of winter sun or some ski or snowboarding action, the February half term requires a little inventiveness and forward-thinking. Many themeparks and many other outdoors attractions are still closed, and the weather might well conspire against spending a huge amount of time outdoors. Happily, most family-friendly museums around the country lay on special school-holiday activities and events that can be life-savers to parents – not least because they’re often free. Worth watching out for this year are exhibitions and events relating to war – 2014 is the centenary of the First World War centenary and also the 70th anniversary of D-Day. 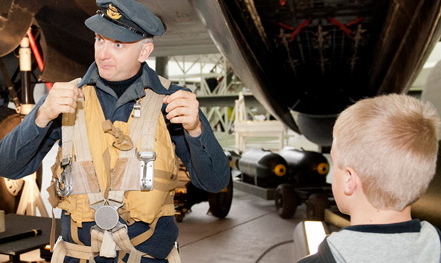 Activities relating to war can be educational and even fun – half-term events at RAF Duxford in Suffolk, for instance, include live interpretations by costumed actors about the Big Week bombing campaign, storytelling sessions and hands-on crafts under the wings of Concorde. There are similarly inventive goings-on in Manchester, where the Museum of Science and Industry (MOSI) is hosting a Steam, Sweat & Sewers program – expect shows, workshops, old engine demonstrations, a Victorian photo booth and even a Victorian fairground with traditional rides and games. Who said museums were dull? Further south, in Kent, atmospheric Leeds Castle is running a week of merriment, mayhem and circus skills, with acrobatics, stilt-walking and fire-breathing from Tudor jester Peterkin, ‘have a go’ sessions in the big top with The Crystal Wizard of ‘Britain’s Got Talent’ fame, and falconry displays. Over in Hampshire, meanwhile, Beaulieu, home to the National Motor Museum, World of Top Gear, Palace House and Abbey, has a ‘hands-on’ half-term focus including the chance to handle historical motoring objects and to race on a giant Scalextric track. Tickets include unlimited rides on the high-level monorail and open-topped replica London Bus. Alternatively, head for the Roald Dahl Museum & Story Centre in Buckinghamshire, with a variety of fun activities for different ages across the week, from puppet-making to rhyming sessions with the poet-in-residence. If you are traveling any distance from home, it’s well worth thinking about a building a city/mini break around a museum visit. This means you don’t have to rush there and back (school-holiday events can be oversubscribed so it’s best to get to a venue for opening time) and can also enjoy a leisurely meal and perhaps even some entertainment. Two or three days in London at half term, for instance, will allow you to take in one of the big museums, a West End show and a special event such as the Imagine Children’s Festival on the South Bank, which runs all week. Other possibilities include the Pop-Up Stories week-long event at the London Transport Museum, with Bimbo the Monkey and his friend Mike the Cat taking visitor on an outrageous journeys to discover the stories of London with the help of the current Illustration exhibition.